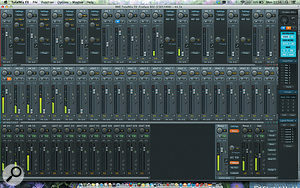 In an industry that moves so fast, it's astonishing to think that RME's Fireface 800 has now been around for 10 years. Its longevity is testament both to the thought that went into its design, and to the company's admirable commitment to long-term product support. When it first appeared, the Fireface 800 was the first audio interface to take advantage of the high data-transfer bandwidth offered by the then-new Firewire 800 protocol; up to three units could be connected to a single computer, with a correspondingly huge channel count. Despite its advantages, however, Firewire 800 never became a universal standard on Windows computers, and Apple have now abandoned it in favour of Thunderbolt and USB 3. And in the course of a decade, other technologies such as A-D conversion and DSP chip design have also moved forward. The Fireface 802 also employs updated mic preamp and converter designs, and has more powerful onboard DSP, permitting it to use all the features of RME's TotalMix FX monitor mixing utility. The practical benefits of this include EQ and dynamics on most channels, plus a global Reverb/Echo effect, and best of all, a comprehensive built-in monitor controller, which integrates with the optional ARC remote control. On the interfacing front, Firewire 400 is still supported, but the increasingly redundant Firewire 800 has been dropped in favour of USB 2. The benefit of this is that the 802 can be connected directly to any current Mac or PC without the need for adaptors or Firewire cards. The down side of this is that it is no longer as straightforward to connect multiple Firefaces to a single computer: it's still possible to attach up to three 802s using Firewire 400, but each of them needs to have its own Firewire controller. I suppose you could argue that RME might have added Thunderbolt or USB 3 to achieve more universal multi-interface capability, but that would no doubt have added to the cost. On some of their other interfaces, such as the Fireface UFX, RME employ digital gain controls for their mic preamps. I personally prefer these (or stepped gain controls) to conventional potentiometers, as they make it much easier to match gain settings across channels, so I was a little disappointed to find out that the 802 still features continuous analogue gain controls. I expect others will feel exactly the opposite way! The review Fireface 802 certainly got a thorough workout in my care. I used it over USB with Pro Tools 11 running on a 2013 Apple MacBook Air, first for a vocal overdub session, then for some location work with a four-piece jazz band, and then to capture a multitrack recording of a two-hour live show. For a second session with the same jazz band the MacBook wasn't available, so I switched to a Windows desktop machine. That quibble aside, though, it really is hard to fault the Fireface 802. Whatever I plugged it into, it always worked first time, and operated flawlessly from the first note of the session to the last. It never caused recording to stop for any reason, never lost ADAT sync, and never introduced anything into the signal that I didn't ask it to. In many ways, it's a tribute to the qualities of the Fireface 800 that the 802 differs relatively little. Where RME have changed things, it's almost universally for the better, but if I was a happy user of the original, I don't think I'd feel the need to rush out and replace it. If, on the other hand, I was in the market for a new audio interface, the Fireface 802 would be very near the top of my list. It's a well-executed update to a well-loved product, and I won't be in the least surprised if it remains a standard for the next 10 years. Many small but worthwhile improvements over the older Fireface 800. USB 2 support provides compatibility with all modern Macs and PCs. Has all the strengths we've come to expect from RME: excellent driver support, pristine audio quality and a comprehensive feature set. 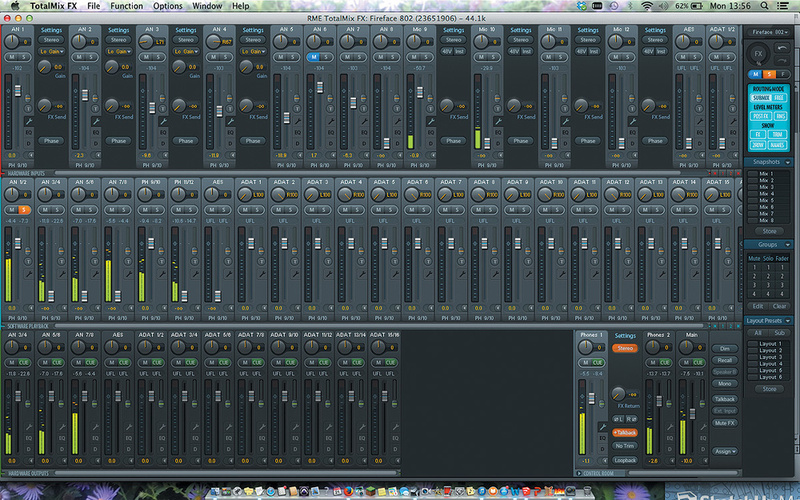 The new-look TotalMix FX is rather dark. The Fireface 802 is a more than worthwhile update to an audio interface that is still in daily use in thousands of studios around the world, and looks set to build on the Fireface 800's reputation for reliability, flexibility and good sound quality. Synthax Inc. +1 754 206 4220.